All institutes, except Japan, last approximately 8 weeks from June to August. Japan lasts approximately 10 weeks from June to August. Foreign language capability is not required for acceptance into the EAPSI program. 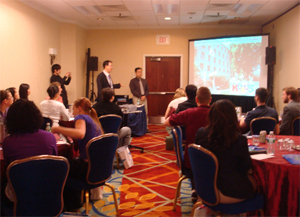 Selected students attend a 2-3 day pre-departure orientation session in the Washington, D.C. area in late March or early April. Each year, the Summer Institutes occur between June and August. Approximately eight weeks are spent on research activities at the host institution. Students work collaboratively with host researchers on the projects. 'EAPSI Korea Program' is administrated by the National Research Foundation of Korea (NRF) and KUSCO coordinates the orientation and Korean language courses, and helps participants move to host institutions. KUSCO also provides financial support for selected students as well.